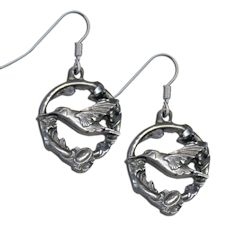 These beautiful teardrop shaped cut out hummingbird earrings are very unique. These hummingbird and flowers earrings are handmade and individually handcrafted, silver plated and diamond cut on dangle copper earrings. The diamond cut really makes them sparkle. They look similar to black hills gold jewelry, but with silver instead of gold. These hand made copper earrings are a dangle inspired and are mounted on hypoallergenic french earwires. They are 1" wide X 1 1/4" long (2.5 cm cm x 3.2 cm), not counting the earwire. No polishing is required for these earrings. Each piece has an acrylic coating to prevent tarnishing, so they will retain their shine. This product was added to our catalog on 11/30/2010.